This is a speech Jeanette gave at the Schuyler Center as part of a panel on innovations in child welfare reform. Today I will talk to you about what’s needed in child welfare reform from a parent’s perspective. That is voice—parents having a powerful voice in their cases and in the system. You might be thinking, why does a parent need a voice? I’m sure you hear us all the time screaming, fighting and arguing at the agencies. But that’s not a powerful voice. I know because that crazy angry parent, that was me. That was me because I felt so scared and so powerless. That’s how most parents come into the child welfare system—feeling powerless. Our life experiences and experiences with authorities have made us feel powerless. Having our child removed is the ultimate in powerless. In my case, I screamed at the top of my lungs because that’s how I knew how to communicate. I thought I was saying what I needed, but no one could hear me. That made my case last three years. When parents are not heard, children suffer. Help parents see that the child welfare system wants to help families—through prevention programs. Give parents a parent advocate from the start to the end of a case. Give parents information and choices about services they need. Bring parents voice into child welfare staff trainings and policy decisions. When parents have a voice—in their cases and in the system—that can assist all involved in making a parent’s experience more successful and less traumatic. Having a voice every step of the way is part of how we can give parents their power back so they can reclaim their lives and their child. Let me share a little of my story so you understand what I mean. I’ll start with the need for prevention agencies that parents can reach out to. At that time I felt very overwhelmed, I can even say scared at times. Being a first time mom and trying to do everything on my own just wasn’t as easy as I thought it would be. It was a scary feeling that I knew I needed help but felt so alone, so isolated. I didn’t have any outlet to help my son and me. I don’t know how I would’ve reacted to services back then, but now I know there are supports that can help families overcome their struggles, their fear of not being a good parent. It’s going to take a lot for systems to convince parents that they can safely ask for help and will be listened to when they do. But it can work. Recently my own family hit a crisis. My family lost our apartment lease and became homeless for five months. In the new place. we didn’t have any furniture, just bins for clothes and toys; we’d lost everything in our moves. Then my son mentioned in afterschool that he was sleeping on an air mattress and that Mommy gets his clothes from a garbage bag every morning. Children’s Aid Society called me for a meeting. I had no reason for fear. It had been over a decade since my oldest son had come home from foster care and I had never been investigated since. I had a good relationship with my children’s school, was active on the PTA and was working as a parent advocate at a child welfare agency. But my oldest son was in a rebellious stage. I felt afraid that people would look at our housing instability and his behavior and the judgments would start all over. And no matter how much time passes, the experience of having outsiders judge you as a bad parent just crumbles you up. So when Mr. B from Children’s Aid came offering help, I told him we didn’t want it. Mr. B let me know that the help he was offering had nothing to do with ACS. He also asked me what I needed and made it happen, without trying to get more involved. That program gave us $1,000 to buy beds for the kids and gift cards to assist with school uniforms and winter clothing. Tears rolled down my cheeks because thinking how to get the boys their coats and boots had me going crazy. To keep children safe, we need to send a message of hope within communities. We need to open more family support programs that don’t make you open a case to get help. And we need to listen to what parents say they need. It’s so important to change the culture of fear in our communities. When I had my case, I didn’t understand what was happening, what was expected of me, why my baby couldn’t come home. It was a blur of everyone telling me what to do and no one seeming to actually care. It felt like my life was being torn into pieces and I had to find the pieces before I could put them back together. If I’d had an advocate I trusted, maybe then I would have not lost three years of my son, my life, to the system. Working as a Parent Advocate at a foster care agency after my son came home, I helped parents understand the system and the process their family will go through. I would comfort and empower the families by being an anchor of communication between the worker and parent, as well as the foster parent and parent. It’s important that this support begin at the start of the case. New York City now includes parent advocates in Child Safety Conferences, the decision-making meetings about whether children should enter foster care. A parent advocate explaining what things really mean for the parent, in simple terms, really helps the parent stay calm and understand what is expected of them. I remember sitting in a case where the family was from Africa and dad was beating the children, but no one in that family saw a problem with it, because that’s how they were raised. Culture plays a big part on how you raise your children. When I explained to the father that corporal punishment is unacceptable in NYC, he looked at me like I was crazy. He also felt powerless because he felt that his culture was not valued and no one was listening to what he believed in. Maybe because I had my son removed for the same reason, I was able to find a way to help him understand. It was very difficult trying to tell a parent how to raise their child, or to change their beliefs because of our laws. But I believe that if I wasn’t in that room that father would not have had a voice and his children would have been removed because he just didn’t understand how to calmly explain himself. I was able to explain things to him in a rational, simple term way, and I also helped find a organization that assists families of African backgrounds, which could understand what the family was going through. Having parent advocates involved in parents’ cases every step of the way can help parents feel heard, listen, and take steps to protect their children without unnecessary escalations and interventions. 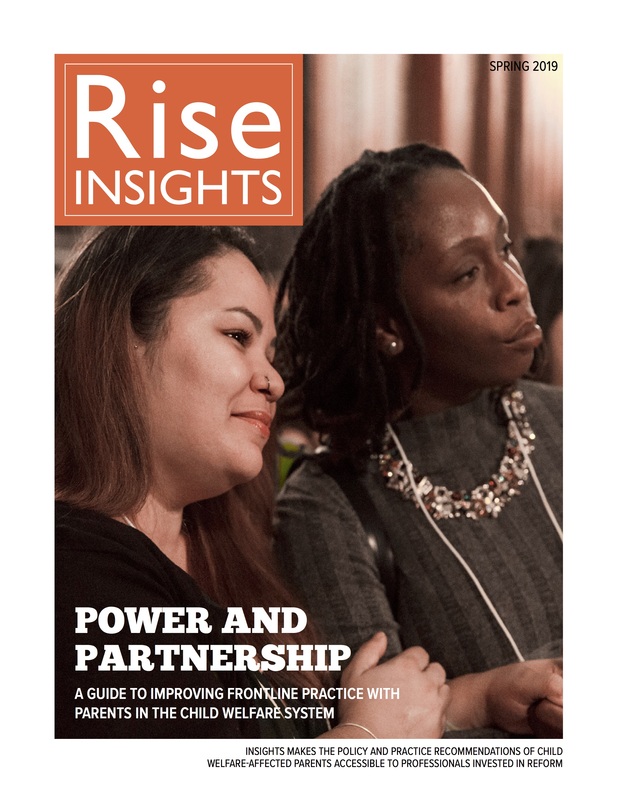 The third thing that parents at Rise feel is important to reform is parents having more of a voice in selecting and evaluating services. A constant theme at Rise is that parents want to be heard not fixed. We want the system to support us in making good decisions about what can help us and our children. Parents want information and choices. If parents had more information about services, then they can make choices about what service may fit their families’ needs. This will enhance the chance of the parent actually complying with the service and sticking with it. When the system allows us to attend bad services, we feel like the only thing important to the system is a certificate, not parents truly feeling better and doing better. When I had my case, they kept sending me to anger management classes. Doing anger management three times did not take away my anger, it made me angrier that I had to keep repeating a service that wasn’t actually servicing me or my family! In reality, I was broken for not having my son. What I felt was grief. What actually helped me—years later—was writing about the pain I felt. Many times the system may think parents don’t know what they need, but I have learned that parents do know what their families need, and if given the chance to understand the options, they will tell the worker what services they think would benefit their families. Parents might need coaching to speak up well for themselves, because once child welfare gets involved, parents feel as they have no say in their lives. But if we invest in providing clear information and choices to parents, we can help parents develop self-advocacy skills they’ll need all their lives. Last I want to speak to you about the importance of giving frontline staff in child welfare a chance to hear a parent’s perspective and giving parents a voice in policy decisions. When child welfare systems are considering new policies and practices, its important to ask for parents’ perspectives and act on them. Right now, Rise is working with ACS on their efforts to improve visits. Without our input, I don’t think they would be focusing on giving parents more information about visits, but that is something parents need. Parents also need to be involved in frontline staff training because caseworkers, lawyers and judges rarely hear from a parent what worked for them and what didn’t, and how they can start making the system better on an individual basis. I want to leave you with the reminder that that the issues parents face are not going to be completely solved when children go home. Families hit crises. Parents are going to have to use their voices to solve family problems. The more child welfare can support parents using their voices during their case, the better equipped they’ll be to solve problems down the road. After my son cam home, I thought it would be easy but in reality it was a scary feeling that I had my baby home and I really didn’t know him. I was confused about what to do and how to do it. My son kept asking me for his own room, his backyard, and God how I cried because I couldn’t afford that type of living. It was just me and him in a one bedroom apartment, and there was no backyard. I felt ashamed and guilty, and I was always worried that ACS would come back in to my life and take my baby again. Because of my fear of losing my son, I was actually too soft on him. It was very difficult for me to tell him no. I would let him sleep when he wanted, eat when he was hungry and play as much as he wanted. There was no structure, no such thing as discipline. That turned out to be a major problem when my husband and I had younger kids a few years later. When they were young, we really didn’t have any rules. Then we realized that structure could benefit them. We started by setting a bedtime. When Dad and I tried to insist on sleep, it was not cute. They would scream or cry. It sounded like we were torturing them. Luckily, I had found my voice in the years after my son came home. I had joined a parent advocacy group where I felt that I could speak freely and not be judged. I had also joined Rise and I used the writing process to reflect on our bedtime struggle – what I just read to you is part of the story I wrote. I was able to stay patient and confident and get my kids to bed. Now it feels good to tell my children, “Goodnight. Tomorrow is another day for fun and games.” I wasn’t always confident that we’d have tomorrow together. I hope you heard today how important it is that parents have opportunities to find their voices throughout their case. It hurt my son and me that I didn’t find my voice until after my child welfare case was over. I know that if child welfare agencies find new ways to bring parents’ perspectives into the system—in individual cases and in training and policy—fewer kids will come into care, and those that do will be more likely to quickly and safely return home.